Index management is useful for increasing store performance. EAV has one disadvantage.it will store data into different tables.so that retrieving data is time consuming. mysql trigger: perform some query actions based on some table insert/update/delete. So magento using trigger for example when price is updating it will store entity_id into changelog table. there is a statement in devdocs for implementing triggers magento2 using Magento/Framework/Mview . can you any one explain flow of this functionality. i mean what is view,action,processor etc? `Allows tracking database changes for a certain entity (product, category and so on) and running change handler. MView stands for Materialized View which is a snapshot of the database at a point in time. https://en.wikipedia.org/wiki/Materialized_view Why would we need to duplicate tables. Indexers are costly to run, especially when there is traffic on category pages, customers place orders and admins save products. On product save the cache gets invalidated (off topic). In case of stock indexer, before it ends the execution, it sends the entity ids affected as cache tags to be cleaned (full page cache type). In Magento 2.0 categories ids of purchased products are sent. In Magento 2.1 the product ids are sent. Update by Schedule makes the indexers to be run in cron. Note that cron indexer group tasks run in a separate php process, as declared in etc/contab_groups.xml: <use_separate_process>1</use_separate_process>. Changelog tables are: [indexer name]_cl (suffixed with _cl). e.g. cataloginventory_stock_cl. If you have indexers set to Update by Schedule and save a product in admin you'll see the entity_id of that product in this table. It's a big circle, I'm thinking place order or create shipment will add here an entry too. This will make sense: //public function execute($ids); Used by mview, allows you to process multiple **entities** in the "Update on schedule" mode } Where $ids parameter has the entities ids from *_cl tables. What is the link between cache invalidation and indexers. Categories pages are now full page cached (built-in full page cache or through Varnish). And it looks like it goes back to 'normal' class of indexers' execute` method which is used by MView. In Mview case, when the new quantities are subtracted in SubtractQuoteInventoryObserver, the MySQL trigger (created for Mview) will insert a row in cataloginventory_stock_cl, marking that a reindex (stock & fulltext) needs to be done to those purchased product ids. There are many MySQL triggers created for Mview. See them all with SHOW TRIGGERS;. When a product gets out of stock after checkout you'll see 2 rows inserted in that table (Magento saves 2 times stock item in these 2 observers). When cron runs stock indexer in Mview mode the affected product ids (in M2.1) or categories ids (in M2.0) are sent to cache clean as cache tags. By cache I mean full page cache type. Example: catalog_product_99 or other cache tag format depending on the Magento version. The same when Mview is not enabled. And Magento_PageCache has observer \Magento\PageCache\Observer\FlushCacheByTags that will clean full page cache type by tags. It does it for buil-in full page cache. Varnish related code is in \Magento\CacheInvalidate\Observer\InvalidateVarnishObserver. Cache cleaning only on out of stock products after checkout was introduced in default Magento 2.2.x. See \Magento\CatalogInventory\Model\Indexer\Stock\CacheCleaner. I'm thinking the cron execution for indexer in Admin > Stores > Configuration > Advanced > System > Cron configuration options for group: index should be set to much more than 1 minute. The mview.xml is used along with indexer.xml to setup indexers. The Mview from Magento\Framework\Mview which emulates the materialized view for MySQL using triggers. Full reindexing can be caused by a variety of things, including creating a new web store or new customer group. You can optionally fully reindex at any time using the command line. Reference from Magento document is already here so I'm skipping that part. Magento implemented materialized view in 2.0 which tracks changes for all indexers. Each indexer has a _cl table which gets entity_id and a auto_increment version_id from triggers added on main tables. When cron job executes, indexer gets last version_id for each view from mview_state table and index next available entities in _cl table. Reindexing was a headache till 1.9.x.x and with huge catalog it always slow down the system. In Magento 2.0 indexer only update the particular entity information on indexer tables rather than reindexing whole data. This keeps ball rolling without slower down the server. Note: Materialized View is not supported in mysql so in Magento, it is managed by PHP code and it works similar to Materialized view which is a feature in enterprise level DBMS like oracle. Not the answer you're looking for? 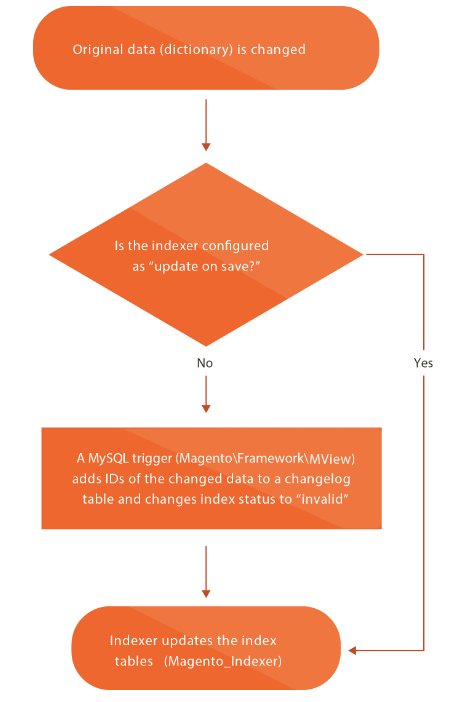 Browse other questions tagged magento2 indexing index mysql-triggers mview or ask your own question. Magento 2: Does magento 2 works without SQL triggers? Is it safe to truncate the catalog_category_product table? What does each entry in index management actually do?